Whales may be spotted in our local waters any day of the year, says whale expert. SOUTHERN CALIFORNIA ― Autumn is known for fall festivals and costume parties, but is it known for whales frolicking in our local ocean? A pod of 10 killer whales were spotted multiple times along the Southern California coast in early October. A gray whale was seen riding the surf in Newport Beach on Oct. 24. Is October an unusual month for whale sightings? Whale sightings are possible any day of the year especially with so many different species – killer whales, gray whales, humpback whales, fin whales, blue whales, minke whales and more, according to Alisa Schulman-Janiger, researcher and co-founder of the California Killer Whale Project. The Oct. 24 sighting off Newport Beach was a juvenile gray whale, Schulman-Janiger confirmed. Schulman-Janiger said the gray whale migration season from Alaska to Baja California is usually between December and February, “but it is not unusual to see several early grays in October and November, especially juveniles. “Juveniles often migrate close to shore and spend more time exploring (curious young mammals) – even in harbors and bays,” Schulman-Janiger added. Bigg’s, or transient killer whales, on the other hand, travel up and down the coast at anytime of the year in search of food. Their diet consists of sea lions, gray whale calves and dolphins, even though these orcas are part of the dolphin family. The offshore killer whales, occasionally seen in California waters, eat shark and may travel with larger pods as well as other marine mammals. Bigg’s are the most common killer whales seen in local waters traveling in small pods and quietly sneaking up on prey. However, “this is the first time that any Bigg’s transient killer whales (mammal specialists – mostly seen hunting sea lions and common dolphin off of our area) have been confirmed as far south as San Diego,” Schulman-Janiger stated. 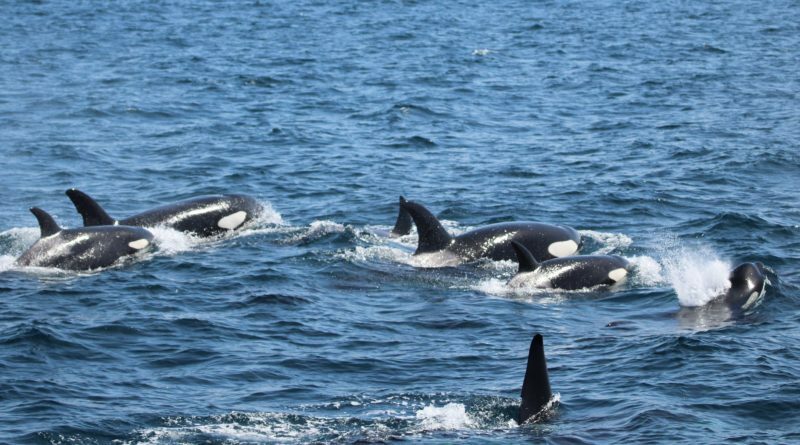 Schulman-Janiger confirmed the 10 orcas, seen between San Diego and Huntington Beach on Oct. 3, 5 and 6, and around Santa Cruz Island on Oct. 11, were a pod of Bigg’s killer whales consisting of two families. “One of those two families in particular – the CA51s (also known as ‘The Friendly Pod’), has been sighted a few times (mostly between December-February) off of the Southland,” Schulman-Janiger said. Carla Mitroff, manager of Oceanside Adventures, also said seeing the CA51s (transient whales category) in San Diego is unheard of until last month, but they were seen in Oceanside last year. Researchers have been able to identify these orcas by distinct characteristics. One of the whales was spotted around the same time last year. Schulman-Janiger identified the family members of the CA216s. Mitroff said the CA51s have been recognized in local water at least once a year. She also said these transient killer whales have a tendency to approach boats. Schulman-Janiger cautions boaters to go slow when they see a blow. “Whales have an excellent chance of surviving a strike from a boat going less than 10 knots; higher speeds are much worse for them.” said Schulman-Janiger. She recommends notifying Harbor Patrol and lifeguards about any whales seen near shore as the situation can create a navigational hazard. She also encourages boaters to take photographs and video of whales when seen – but not to get too close. Killer whales, aside from their name and size, have never attacked a human in the wild. Keeping a distance of 50 feet away, as The Log previously mentioned, is for the safety of the whales. They may approach a boat, but an exposed propeller or going too fast can seriously harm the mammals. Sharing images can help researchers determine if the mammal is a rare species, an entangled whale and/or has been spotted before. The information can contribute to research by tracking the movement and behavior of whales. “For example, we REALLY would like to get a resighting of the emaciated juvenile gray whale that was seen many times close to shore (often in marinas and harbors) in August, from below San Diego to Los Angeles Harbor – to confirm that it did survive,” Schulman-Janiger stated. Boaters, who come across killer whales, can send details about the sightings, photos and/or video to Schulman-Janiger at janiger@cox.net. “I will let them know which whales they encountered and will send them background details on their whales,” Schulman-Janiger relayed. Schulman-Janiger is also the director of ACS/LA Gray Whale Census and Behavior Project and a research associate with Natural History Museum of Los Angeles County.